SHANGHAI, June 19, 2018 /PRNewswire/ -- June 14, the 2018 Global Esports Leader Summit and Tencent Esports Annual Conference with the theme of "Realize the power of Esports" was held at the Shanghai World Expo Center. 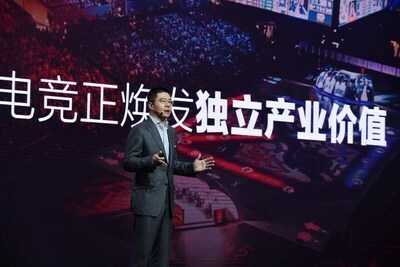 Cheng Wu, vice president of Tencent Holdings Limited and CEO of Tencent Pictures, stated that the golden five years of China's Esports industry have started successfully and a critical year of in-depth layout awaits, during which process the gradual emergence of the value of Esports as an independent industry has played the most significant role. Behind the development of Esports industry, the five powers of more popular user participation, stronger social identification, more diversified and in-depth commercialization, more extensive geographical integration, and multidimensional talent cultivation system are changing constantly, injecting new impetus in the industry. The speech made by Mr. Cheng is as follows. Cheng Wu: Good afternoon, everyone! Welcome to Tencent Esports Annual Conference! Looking back at the development of Esports industry in China in the past year, there are several impressive firsts. Last fall, the world's most influential global finals of League of Legends was held in China for the first time; and on May 20th last month, a Chinese Esports team RNG just won the midseason championship of League of Legends, and Uzi, a genius and star player in the team, picked up the world champions trophy for the first time, making his own dream come true. Moreover, last month, the Olympic Council of Asia officially announced that Esports will be added as demonstration sport and six Esports titles will debute at next year's Asian Games. Thanks to the rapid growth of China's Esports industry that these very rare firsts could be realized. At the Tencent Esports Annual Conference last year, we proposed that China's Esports industry will enter a golden period of five years. In this process, the most significant embodiment, as Mark said in the morning, is the gradually emerging independent industry value of Esports. After more than ten years of exploration and accumulation, Esports has grown into a healthy and orderly emerging industry with stable development. According to Penguin Intelligence, in 2017, the market size of China's Esports industry will exceed 5 billion, and this year, it is forecast to reach 8.44 billion, and by 2020, the market size is expected to exceed 20 billion. What is driving the rapid growth of the entire industry? Just like the theme of today's press conference, "Realize the power of Esports," we believe that behind the development of the industry, there are five powers that are constantly changing and injecting new impetus in the industry. The first potentiality is more popular user participation. According to analysis, China's Esports users will exceed 300 million this year. China has truly become one of the Esports markets with the fastest development speed, the highest popularization rate and the most active users. Last year, the LPL division of League of Legends professional league has an annual live viewing of more than 10 billion people. Last year, KPL's content viewing and page view also exceeded 10 billion. The KPL Spring Finals, which is about to start next month, is expected to attract 15,000 people to come to the venue and enjoy the live event, which will set a new record for total live audience of mobile Esports events. All these figures represent a kind of strength and trend, proving that an era of universal Esports is coming. The second potentiality is social recognition. As a competitive sport, Esports is gaining more and more recognition. Research shows that 66% of respondents agree that Esports is an actual sports practice. The deep participation of celebrities has made Esports a fashion trend as well. You may still remember the showdown between Li Yifeng, the popular actor and Zhang Jike, the table tennis Olympic champion in the KPL Finals last year. The cooperation between Lu Han, a popular celebrity, and Esports clubs also attracted the attention of many fans of him. Many sports stars, including Fu Yuanhui, the famous swimmer, are also loyal fans of League of Legends events. These make more and more people have the opportunity to know and better understand Esports. At the same time, Esports has also been recognized by international sports organizations including the International Olympic Committee and the Olympic Council of Asia, which will help Esports better integrate into the mainstream culture. The third potentiality is the iteration and upgrade of Esports business model. In the past, the commercial value of Esports often equaled to the exposure of the events or the realization of traffic. Colleagues here may have had similar experiences that in the past, it was not easy to find sponsorship for game tournaments and most of the opportunity of commercial cooperation were basically hardware manufacturers. However, nowadays, learning from professional sports operations are opening up a bigger business map for Esports. On the one hand, Esports business partners are more diverse. From the sponsors list of LPL and KPL tournament, we can see that in addition to the traditional hardware manufacturers, there are also companies in the automotive, FMCG, and financial sectors. On the other hand, the Esports business model is also optimizing gradually. Esports industry today is standing on the shoulders of a giant named traditional sports and have gradually developed its commercial value of multi-modules such as media copyrights, derivatives, tickets, and advertisements. The licensing fees for events such as LPL and KPL have reached the threshold of 100 million yuan, which is quiet inspiring for the entire industry. Many partners told us that they are optimistic about Esports industry because it is young, upward, and represents a competitive spirit that has no fear to fight. Such spirit can be shared and can strike a chord among hundreds of millions of Esports enthusiasts. I think this is the unique commercial magnetism of Esports. The fourth potentiality is the geographical integration of Esports. As a popular sport, Esports is now endowing cities with new meanings and it is a necessary stage of development for Esports and cities integrating with each other. As Mark mentioned this morning, imagine if you were talking about Manchester, what would your first impression be? Will it be Manchester United? Speaking of Los Angeles, the Los Angeles Lakers may be the first topic to be blurted out. Many examples show that events, clubs, and well-known competition venues are all integrated with the city and become unique local cultural labels. In the future, will Esports become the next cultural business card of the city like football and basketball? I believe it's more than just a wish. At the moment, many LPL clubs have set up home stadiums in cities such as Shanghai, Hangzhou, Chongqing, Chengdu, Xi'an and Beijing. KPL has also announced its eight-year plan for home and away games. Not long ago, in order to welcome team WE back home and set its home court there, Xi'an held a grand entry ceremony at Yongning gate. These are all positive signals and we hope that in the near future, every city will have its own representative Esports team. The last potentiality is talent cultivation. In the past year, Esports education has become a hot spot for the entire industry. Compared with the 30% growth rate of Esports industry, the development speed of Esports education is still far from enough. Therefore, from this year onwards, more and more colleges and universities, educational institutions and other partners are actively deploying Esports education. Together with Tencent Esports, they will build multidimensional talent cultivation system from academic education, vocational education and mass education. The training system will be more targeted to solve talent output problems in hot demand positions such as content production, event execution, and dissemination. In-depth changes in the five major powers are affecting the future of China's Esports, and also determine the Esports development pace of Tencent. In the next stage, our strategy is, in simple terms, divided into three steps: firstly, accumulate power. We will consolidate the foundation by cultivating talents and improving the competition system. Secondly, gather power. We will link upstream and downstream partners in the industry chain and strengthen the integration of Esports and cities. Finally, share potential power. We will fully release the capabilities of Tencent Esports itself, cooperate openly and complement other's advantages, so that the Esports+ industrial ecology can bloom with more vitality. At the summit this morning, many guests mentioned that Esports is creating more cultural possibilities. Both The King's Avatar, the hit animation last year, or Grandpa in the Jungle, the new animation on Tencent Comic, are new works derived from Esports. It can be seen that the era of Neo-Culture Creativity we live in has provided new cultural imagination for Esports. And Esports is now colliding with other digital content, such as animation, film and television, to create a more comprehensive and multidimensional digital cultural experience. As a new industry, Esports will have more possibilities in the future and we need to explore them together. Tencent Esports hopes to work together with partners in the industry to grasp the golden years of China's Esports development and gather power to realize power! Thank you! Tencent Esports is China's most competitive Esports brand. Tencent Esports business started in 2010 as TGA, and the official brand was established on December 9, 2016, forming a Neo-Culture Creativity digital content industry matrix together with Tencent Games, Tencent Animation & Comics, China Literature and Tencent Pictures. 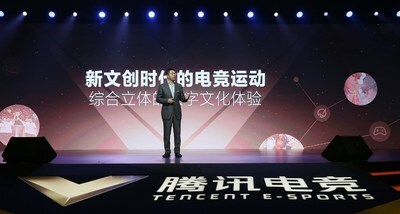 In the view of Tencent Esports, the Esports industry is a mix of digital entertainment, cultural and sports industry based on games and beyond games. It integrates technology, sports, entertainment, and social networking with unique business attributes and user value. In 2018, as the in-depth layout year of the golden five years in Esports industry, Tencent Esports will focus on learning from professional sports operations, and adopt three specific strategies of systematic upgrade, city-integrated layout and standardized operation. Tencent Esports will provide more support for the overall development of the Esports industry in China from aspects including professional and comprehensive Esports events, Esports talent cultivation, Esports eco-building, user value realization, and business value mining.